The Audio/Visual Team of Deep Creek Baptist Church plays a vital role in the Worship experince on Sunday Worship and for Special Events. 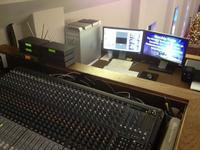 The A/V team, though behind the scenes, is crucial to leading the people of Deep Creek in worship. The team consist of audio (sound), graphics (lyrics) and video specilist. The A/V Team is responsible for running the sound system, recording services, inputing visual aids, and running the Easy Worship software program for Sunday Worship and Special Events. If you are interesting in serving on the Audio/Visual Team, email the Team Leader at the link above! We would love to have you!